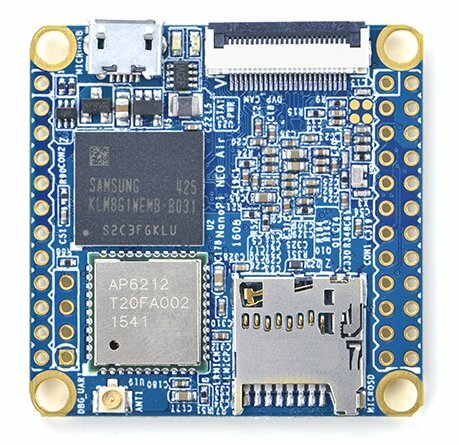 The FriendlyARM NanoPi NEO Air is a single-board computer, a close relative of the NanoPi NEO. This image uses the Tumbleweed kernel and userspace, but a u-boot-nanopineoair package not yet in Tumbleweed. I have openSUSE Tumbleweed running, wifi is working, LEDs are working. I think the DTB file needs definitions for the RTC, ntpd cannot sync the clock. Currently the openSUSE Tumbleweed JeOS image does not boot, as the u-boot on the NanoPi Neo Air does not support EFI boot. Instead, it will default to booting the FriendlyCore from the eMMC flash. Updating using eFlasher to the current u-boot and FriendlyCore does not help. The NanoPi Neo appliance with openSUSE Leap15.0 does boot and is relatively easy to upgrade to get the Wifi interface to work. This page was last modified on 30 January 2019, at 09:17.